RP-Sanjiv Goenka Group owned music label Saregama India Ltd., India’s largest and best-known recording company is up with a new digital initiative, for its partners across advertising agencies, film production houses and television Industry. It’s a Song Selector B2B tool that allows a user to search the appropriate song as per their storyboard situation/occasion from our 1,17,000+ strong catalogue for embedding in their creative. Saregama’s B2B tool will be available to the creative team of agencies as well as their affiliated production houses. Saregama’s repertoire of music comprises of various genres starting from the crafted richness of ‘Indian Classical music’ to the incomparable grace of the ‘Ghazal’ to the utter submission of the ‘Bhajan’, the swerve and the volley of the Qawwali to the rich tradition of ‘Folk’ music. This B2B tool is easy to discover the right content, by the name of the song, by theme as well as moods. 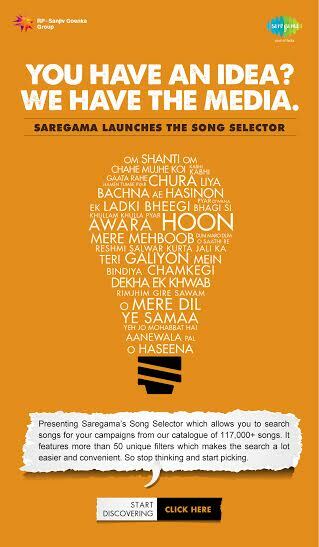 Managing Director of Saregama India Ltd., Mr. Vikram Mehra comments “ Our new initiative the Song Selector is a Single License Window which will ensure all our partners an easy process of selecting songs from our vast repertoire”. This entry was posted in Trending News and tagged Saregama’s Latest Digital Initiative. He stormed into Bollywood with a quiet but very powerful debut as the baddie in ‘Mardaani’. 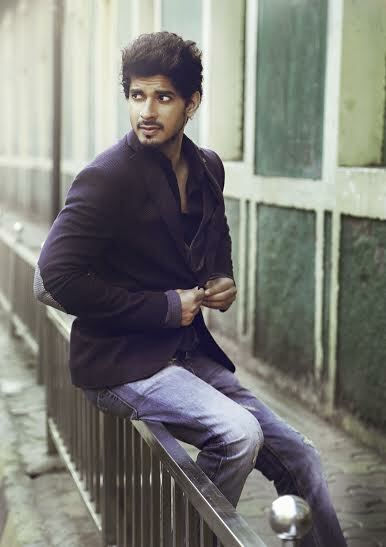 YRF Talent Tahir Raj Bhasin, the atypical upcoming star of Hindi cinema who won accolades with his very first film, is now ready for some action, quite literally! He will act in the forthcoming ‘Force 2’ along with John Abraham. Tahir, a film studies graduate from Australia, who stuck it out to get a suitable first film in Mumbai, won rave reviews and huge popularity with his bad turn in ‘Mardaani’. Holding his own against a seasoned performing star like Rani Mukherjee, his appeal with audiences is evident from the fact that the Times Celebex Poll has judged him the hottest baddie in town. In picking his second film, too, he has focused on playing a realistic hero, one with shades of grey & layers to his persona. ‘Force 2’, a gritty crime drama, will be shot in Budapest for 2 months, and Tahir is currently preparing for the role. With a powerful script & an interesting part to play, this promising actor is bound to deliver a mix of bad in a good way in this role too! This entry was posted in Trending News and tagged Colors It Grey, Tahir Raj Bhasin Signs ‘Force 2’. 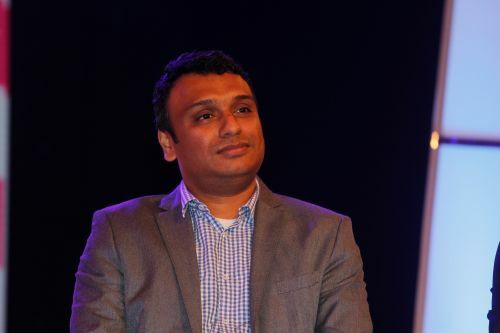 Vivek Kajaria, a man who entered in the film and media industry as Ad film producer. With his dedication and passion towards film, today he is a successful film maker of the movies like Fandry, Siddhant, Anumati to mention few. Vivek has caught the right nerve of the audience understanding their desire for quality cinemas. This National Award winning film maker continues to amuse us with his upcoming cinemas like Chaurya, Ek Number, Raakshas and many more to come. Taking a step forward with his pool of knowledge, Vivek Kajaria is all set to try his fortune as director. Vivek has recently completed a short film named ‘Durga’. The story revolves around a poor Village Artist (Bhola), who makes Idols of Goddess Durga, his love for his grand daughter and ultimately the faith of a worshipper of Goddess Durga with the final task to do justice to his very existence and purpose in life. Adding to the zest, Durga is selected for this year’s Busan International Film Festival to be held in Korea. The film is also expected to be seen at various National and International film festival in this year. In Durga, audience will witness power packed performances by Veena Jamkar, Saachi and Kalyan Chatterjee, produced by Vivek Kajaria’s Holy Basil Productions and also his first attempt as director. This entry was posted in Trending News and tagged Fandry’s renowned Producer Vivek Kajaria now turns to direction. DIVYA KHOSLA KUMAR GOES THE ANGELINA JOLIE WAY ! 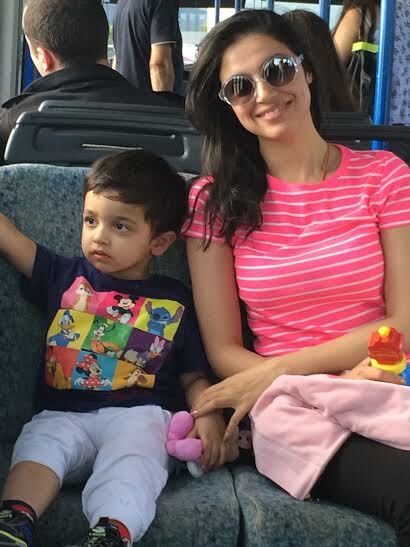 The new Angelina in B-Town is none other than the the super-mom, Divya Khosla Kumar. Being a working & a doting mother, Divya says “It is very necessary to devote unconditional attention to your child so that he doesn’t feel neglected.’’ She adds while travelling for shoots and other work commitments she finds it very hard to leave her son behind and always has him accompanying her on her month long schedules. According to Divya, the best decision she has taken, is enrolling her child into an international IB school. She concludes this choice has been very beneficial for her as she is currently shooting in Canada for her upcoming release Sanam Re and enrolling her son to an international school ensures that she doesn’t have to worry or bother about being away from him or her son missing out on any part of his education back home. Apparently, Angelina Jolie is said to follow this trend since she is travelling for a greater part of the year and does not believe in being apart from her children for such long periods of time. This seems to be quite a bonus tip for all those travelling mothers! Kudos to Divya for being such a talented and work-oriented person but not forgoing her duty towards her family! This entry was posted in Trending News and tagged DIVYA KHOSLA KUMAR GOES THE ANGELINA JOLIE WAY !. Akshay kumar performs in America. This entry was posted in Trending News and tagged Akshay kumar performs in America..
Sooraj– Athiya the freshest ‘IT’ couple of Bollywood!! BTown’s freshest couple Sooraj Pancholi – Athiya Shetty is now contending for the IT couple of Bollywood. Believe it or not but the duo are making heads turn wherever they go. Ever since the trailer released and both started with their promotions, onlookers have always had something to say about their chemistry. Pressure builds up as the Star-Kids set out for their debut with huge industry expectations. Some movies often bring Jodis who undeniably have the gift to sizzle the screen. Such Jodis also become the audience favorite, and they want to see them together more frequently. They become the IT couple of Bollywood. Aamir Khan – Juhi Chawla and Shahrukh Khan – Kajol are an example of evergreen iconic Jodis. Such Jodis define the genre of Love and Romance. Among the fresh faces; Varun Dhawan – Alia Bhatt and Aditya Roy Kapoor – Shraddha Kapoor have nailed it perfectly. The audience is always eager to see them in one frame. Hero is Produced by Salman Khan and Subhash Ghai and Directed by Nikhil Advani. Released worldwide by Eros International on 11th September 2015. This entry was posted in Trending News and tagged Salman Khan and Subhash Ghai and Directed by Nikhil Advani, Sooraj– Athiya the freshest ‘IT’ couple of Bollywood!!. Kaun Kitney Paani Mein deals with the most critical challenge faced by the 21st Century – WATER!, directed by Nila Madhab Panda, Funded by One Drop Foundation, Montreal and Produced by Eleeanora Images and One Drop Foundation, is slated for 28th August 2015 release. The Film stars Kunal Kapoor, Radhika Apte, Gulshan Grover and Saurabh Shukla. Other Credits includes, Music on: Zee Music, Lab : film lab, Executive Producer: Bidhu Bhushan Panda (Biju), Director of Photography: Subharnsu Das, Story: Nila Madhab Panda, Deepak Venkateshan, Screenplay: Deepak Venkateshan, Dialogue: Rahul Singh, Chief Asst. Director: Anuj Tyagi, Associate Director: Santosh Kumar, Creative producer: Supratik Roy, Editor: Deepika Kalra Biren Jyoti Mohanty, Production Designer: Tariq Umar Khan, Sync sound & Sound designer: Sameer Patra, Sound engineer: Bobby John, Mixing Engineer: Saneel PK, Lyrics: Protiqe Mojoomdar, Shubhi khanna, Music:Krishna Beura – (Rangobati – Rangobati), Style bhai – shubhi,Bishakh- Kanish – (Chala Murari), Costume Designer: Barnali Rath, Animation: Philm CGI, VFX : Avilash Nanda and Shelly Sharma, Background Score: Mangesh Dhakde, Choreography: Arvind Thakur, Action :Heera singh Atwal, Visual promotions : Chin2 sing (chin up films). 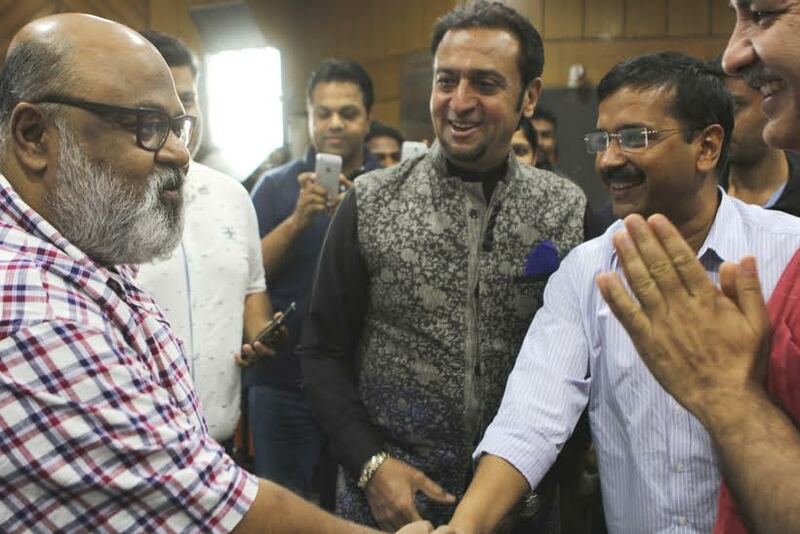 This entry was posted in Trending News and tagged Delhi CM Arvind Kejriwal watches Kaun Kitney Paani Mein, Gulshan Grover and Saurabh Shukla, Kunal Kapoor, Radhika Apte. Bhatt shocked by similarities in his next story and the Indrani-Sheena case! 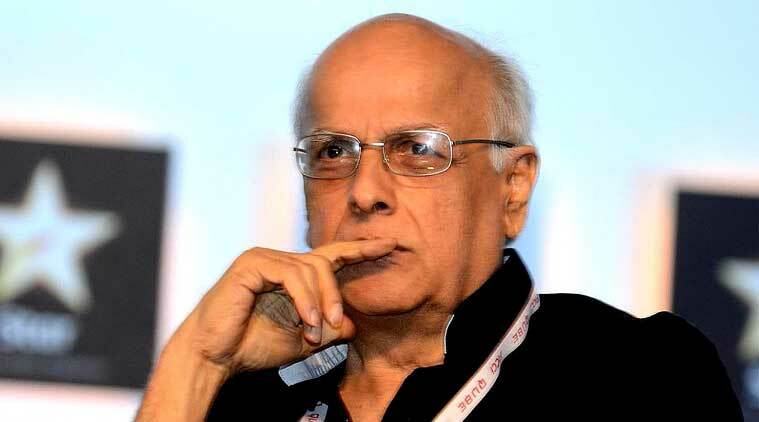 Mahesh Bhatt has scripted his next, Ab Raat Guzarnewali Hai, assisted by Suhrita Sengupta. The film that will be directed by Bhatt’s protege Guroudev Bhalla, is being produced by Dhaval Jayantilal Gada and presented by Zee. Bhatt had finished his script in May 2015 and what has shocked the filmmaker are the similarities between Indrani -Sheena story and one that grew out of his imagination. When further asked him with the Indrani-Sheena story in the headlines, will he add their real-life story into his reel-life story, “No, my work is done, I only wrote this story for my protege. The film should roll in December. I never imagined that it would explode for real as the mother of all crime stories,” says Bhatt. This entry was posted in Trending News and tagged Bhatt shocked by similarities in his next story and the Indrani-Sheena case!, mahesh bhatt. Kuch Keemat Bhi, Kuch Keemti Bhi, the unique marketing campaign that provided OLX, India’s largest marketplace for used goods, with a significant brand recall; is now on air in its second leg after the resounding success of the first leg earlier this year. This time, 92.7 BIG FM, India’s No. 1 radio network and OLX have conceptualised something new for listeners – a segment on-air narrated exclusively by Bollywood actor Ayushmann Khurrana. Through Keemti Stories, the talented actor-singer and former RJ-VJ narrates stories reiterating the meaning of Kuch Keemat Bhi, Kuch Keemti Bhi. The stories focus on human relationships which bring out the messaging that – the gestures and the thought behind gifting your loved ones are more precious than the gifts themselves. Another distinctive aspect of the campaign is that, with the start of the festive season, each story will showcase stories that have an occasion-based theme. The one hour segment goes on-air across six cities that include Delhi, Mumbai, Chandigarh, Kanpur, Bhopal and Allahabad.Ayushmann comes on-air during the segment to narrate stories that are intended to strike a chord with listeners. 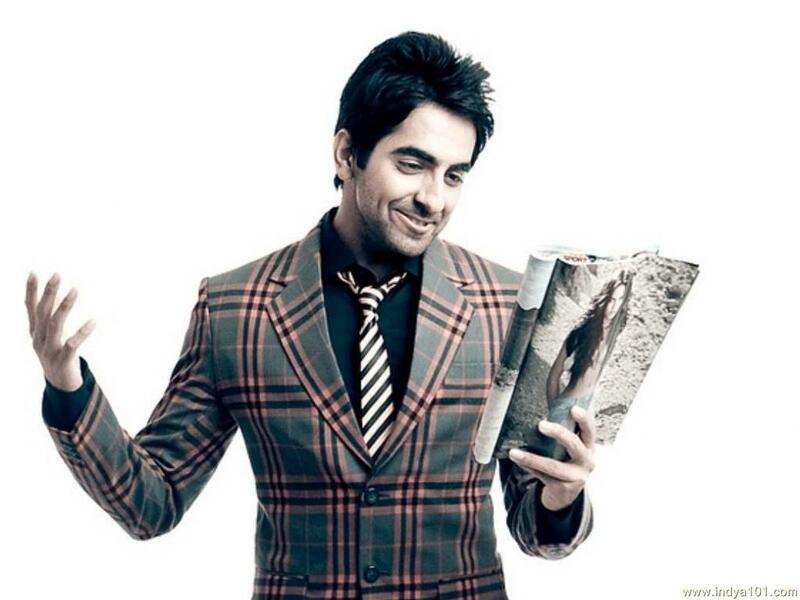 This entry was posted in Trending News and tagged AYUSHMANN KHURRANA ON 92.7 BIG FM FOR OLX. Weekends can be monotonous and keeping this in mind, &TV, is all set to become the ultimate weekend entertainment hub! To make weekends even MORE entertaining &TV presents 2 new blockbuster shows, DEAL OR NO DEAL and AGENT RAGHAV – CRIME BRANCH starting 5th September every Sat-Sun at 8:00 PM and 9:00 PM respectively. 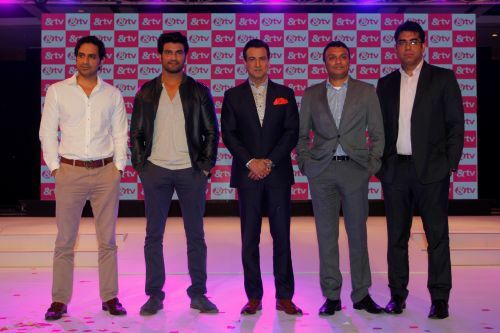 With the new shows’ launch, &TV continues to offer a dynamic mix of breakthrough contemporary content across genres, staying true to the promise of catering to progressive viewers of New Age India. This entry was posted in Trending News and tagged &TV on the new weekend shows, aryeman raj, Business Head, Rajesh Iyer. The next weekend blockbuster – a never seen before fast paced crime-mystery thriller titled Agent Raghav – Crime Branch from the house of Contiloe marks another strategic step by &TV to build its weekend programming slate. 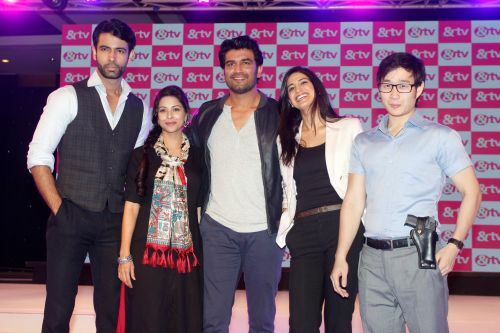 With a contemporary look and international appeal, the show is certainly the channel’s entry into the crime genre with popular actor Sharad Kelkar in a completely different avatar – that of Agent Raghav Sinha. An expert of body language, mind reading coupled with exemplary observation and deduction skills, Agent Raghav solves the most complex cases that may seem hard to understand. Agent Raghav – Crime Branch is co-powered by Quick Heal Gadget Securance and Quikr Cars. 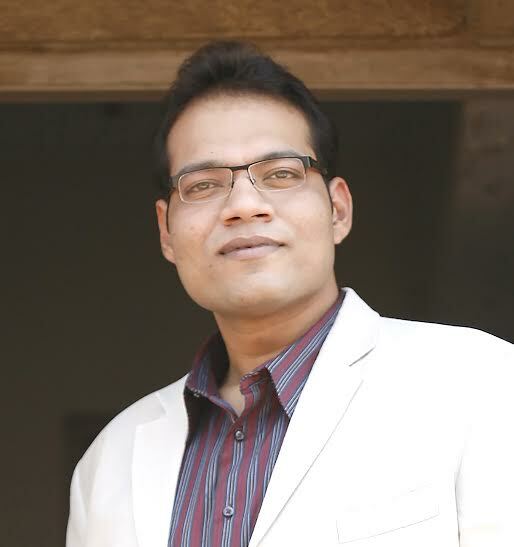 This entry was posted in Trending News and tagged Abhimanyu Singh, aryeman raj, CEO - Contiloe, Sharad Kelkar as Agent Raghav – Crime Branch, tv. Produced by Endemol Shine India, DEAL OR NO DEAL is adapted from a renowned international format, a game show that will see the biggest twist in its Indian edition. 26 family members… 26 briefcases… 1 Banker and 1 crore to be won! The format attempts to bring back the flavour of family game shows in India where one of your family members help you inch closer to your dream. 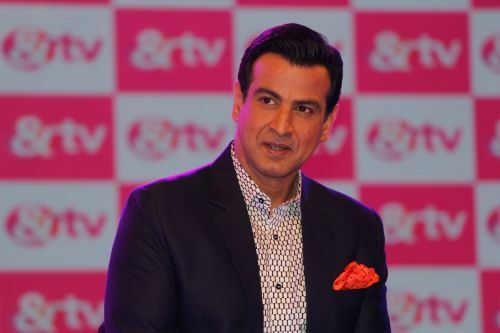 In its true sense, Deal Or No Deal is an Asli family game show that will see the popular, inimitable actor and a favourite with every household –Ronit Roy take on the mantle as the host of the show! Snapdeal is the title sponsor of Deal or No Deal and the show is powered byPayU Money and supported by Syska Total Security. 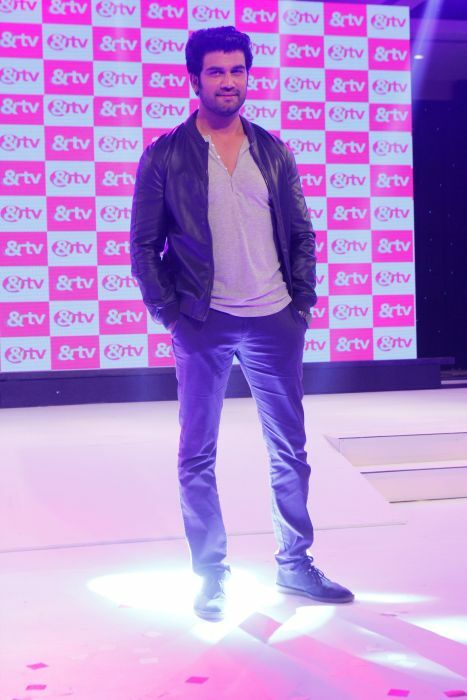 This entry was posted in Trending News and tagged DEAL OR NO DEAL, Ronit Roy, tv. It is the ironic journey of Gour Hari Das. As a young boy and a part of the ‘Vanar Sena’ in Balasore, Orissa, he fought the British. In the later years of his life, when his son refuses to accept that he was a freedom fighter, Gour Hari Das obsessively pursues the Tamra Patra (freedom fighter’s certificate) for 32 years to prove his point. While most actors like Vinay Pathak and Konkona Sen Sharma have played roles beyond their age, they have consistently stood out with their performances. The body language they have exuded in their portrayals is commendable. Pathak is restrained in his demeanour and does full justice to his role. Konkona doesn’t have stealing moments yet adds the slight limp to lend value to her role. One expected some wow moments from her role but somehow the character is just a caricature in the film. Ranvir Shorey as the journalist and protagonist who supports Gour Hari to fight his battle has different shades which he pulls off with ease. Tannishtha Chatterjee supports the cast superfluously. What is commendable is the ensemble cast who have agreed to do small roles since the characters lend some value to the story flow . Truly commendable in the narrative, C P Surendran has chosen just the right scenes from reality to give a smooth and uninterrupted flow to the film. The dialogues are a stand-out, almost piercing like a pin and driving the country’s current status bang on. It requires guts for a director to make a film on such a subject. More so, the producers deserve a pat on their backs for producing such a venture which could win them critical acclaim at film festivals and not rake the moolah at the box-office. Resul Pookutty leaves its mark in some scenes. The shot taking has some brilliant moments. Anant has ensured that he has a subtle product on hand without glorifying the filmi touches or jerks which promote an inspiring film. He has done a brilliant job and handled the story with kids gloves. This film could win some awards and garner critical acclaim. The film will suffer stiff competition from commercial films being released this week. However, classes who appreciate intelligent cinema will definitely watch it. Overall box-office collections could be low but may pick up in the coming weeks like Masaan did. 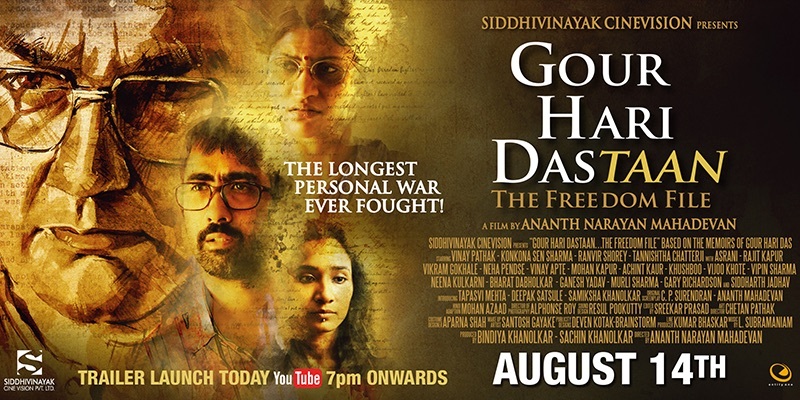 This entry was posted in Trending News and tagged Asrani, Bharat Dabholkar, Bollywood film review - 'Gour Hari Dastaan: The Freedom File' Must watch on this Independence Day. Subtle yet inspiring. Rating – 3.5, Konkona Sen Sharma, Murli Sharma, Neena Kulkarni, Rajit Kapur, Ranvir Shorey, Siddharth Jadhav, Tannishtha Chatterjee, Vinay Apte and Vikram Gokhale, vinay pathak.